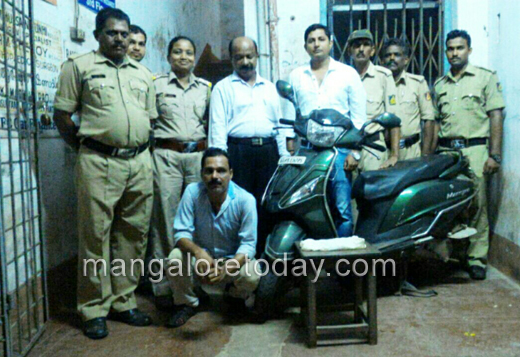 Mangaluru, Aug 3, 2016 : Excise officials of Mangaluru under the leadership of Excise Inspector Sunitha have arrested a person named A Rajesh of Kulshekhar and have seized 200 grams of ganja and 100 grams Charas which he was unauthorisedly transporting with an intention to sell the same in his motorbike. The arrest was made near Milagres Church on August 2, Tuesday. The value of the seized drugs is estimated at Rs 60,000.The accused has been produced before the court. Investigations are underway. The ganja peddling is at ;large in the city these days. The ganja peddlers in the city will they agree to give it to their family Then , Why others ?